Tortoises Teaching Us Through Touch-Screen Technology! I am beyond excited to share this post with you! Huge breakthroughs have been happening for tortoises and turtles behind the scenes for decades, but most of the world has no idea what we have accomplished and learned from these complicated reptiles. Thankfully, a new study has proven what reptile trainers, zoo, aquarium and nature center educators, and reptile enthusiasts all over the world already knew; turtles and tortoises are not simple, mindless creatures. Thanks to scientists who are thinking outside the box, and who are willing to share their results, the world will finally know that turtles and tortoises are capable of decision making and complex cognitive behavior. Yes, you read that correctly; tortoises and turtles make deliberate decisions, and use complex thinking to solve problems, and to gain rewards for themselves. The title of this post is actually true! Tortoises have officially entered the world of touch-screen technology! Scientists recently discovered that tortoises are capable of learning how to use an electronic device in exchange for strawberries! The tortoises not only mastered the task in exchange for strawberries, but the animals also transferred their knowledge to a real-life setting. The tortoises they chose as test subjects for this experiment were Red-footed tortoises. Like most turtles and tortoises, they are very inquisitive and very eager to eat tasty treats. “This makes them very good test subjects”, Anna Wilkinson, of the University of Lincoln, England explained. These tortoises lack a hippocampus. This is an area of the brain associated with learning, memory, and spatial navigation. 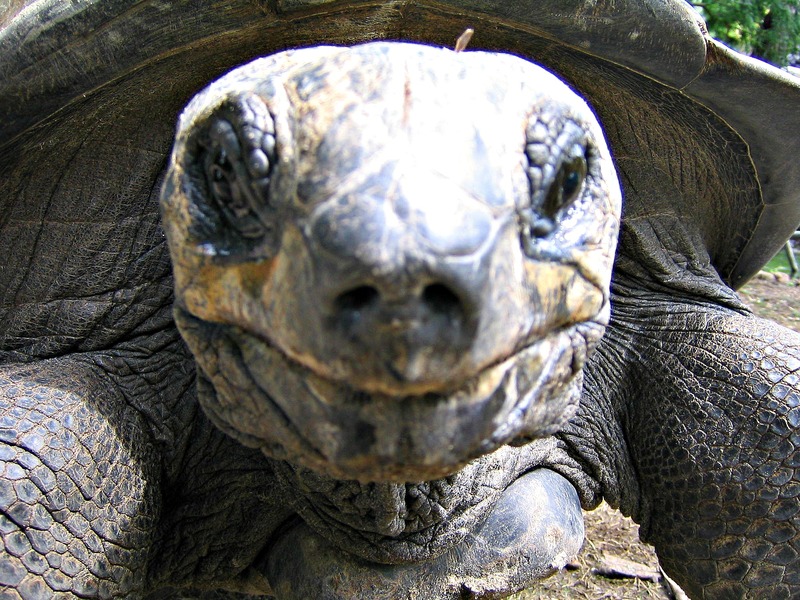 The researchers believe that red-footed tortoises may rely on an area in their brain called the medial cortex. This is the same area associated with complex cognitive behavior and decision making in humans. 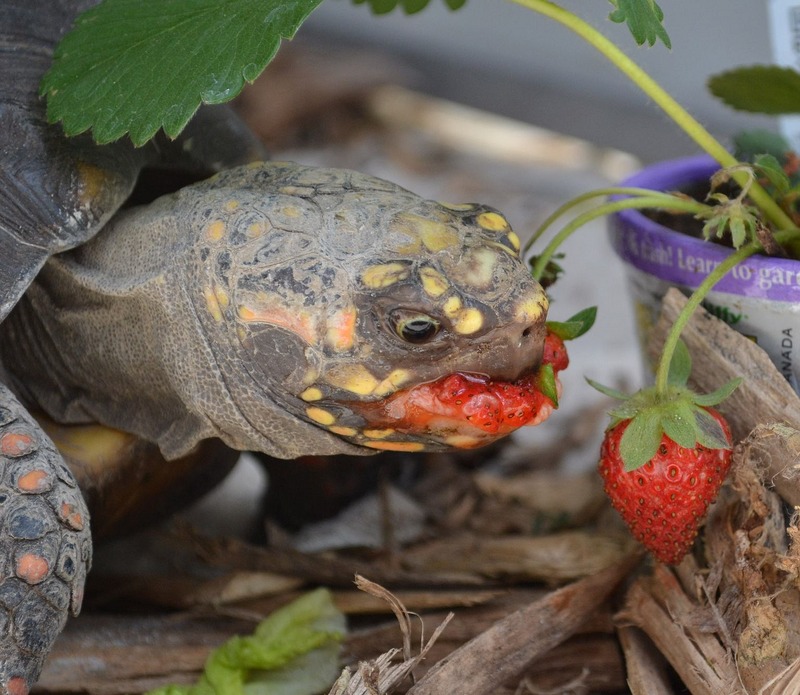 What better way to a tortoise’s heart than through a strawberry?? First the researchers needed to understand how tortoises learn, so they tested how the reptiles relied on cues to navigate the area. 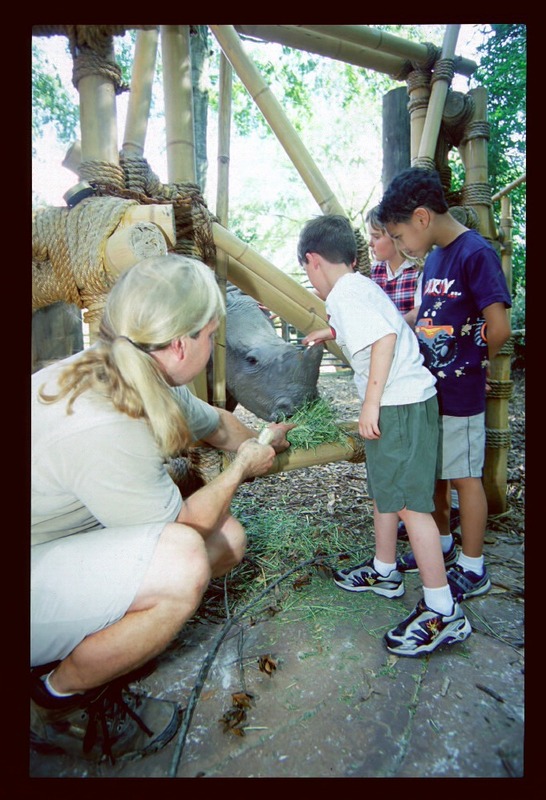 To do this, they gave the tortoises treats when the reptiles looked at, approached, and then pecked on the screen. All four red-footed tortoises learned how to use touch screens fairly quickly. The tortoises attempted to bite a red triangle in the center of the touch screen. When two blue circles flashed, the tortoises had to consistently peck at either the circle on the right, or the one on the left to get a tasty strawberry. The results: All four of the tortoises mastered the tortoise touch-screen task! However two of the tortoises eventually stopped cooperating; Wilkinson explains that it’s possibly because these two were too small to reach the screen. Two of the tortoises, Esme and Quinn, continued to try and applied their knowledge to a real-life situation. You can watch part of the experiment below. The video below is a test of spatial cognition. This Red-footed tortoise was presented with shapes in varying positions, and she was rewarded with strawberries when she touched the targets. In the next part of the experiment, the remaining two tortoises applied their knowledge to a real-life situation. The researchers placed the tortoises in an arena with two blue, empty food bowls that were similar to the blue circles on the touch screen. The tortoises walked over to the bowl on the same side as the red circles that they were trained to bite at on the screen. The researchers then trained the tortoises to go to the opposite blue bowl in the arena to see how flexible they were with learning. When they were reintroduced to the touch screens three months later, the tortoises immediately began biting at the same side of the screen as before. These new findings will help researchers compare the perceptual and cognitive abilities of tortoises to other animals that can perform the same tasks. 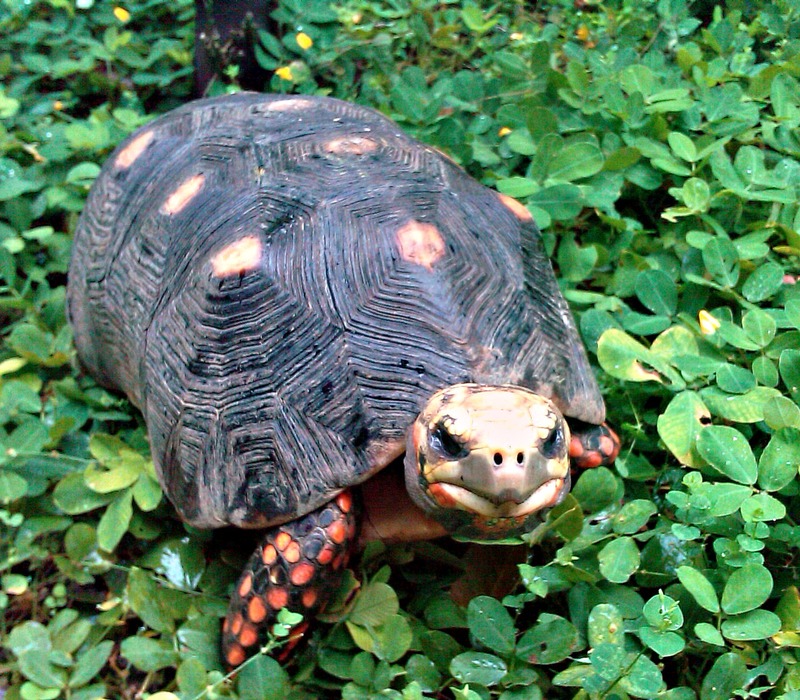 Red-footed tortoises are native to Central and South America. 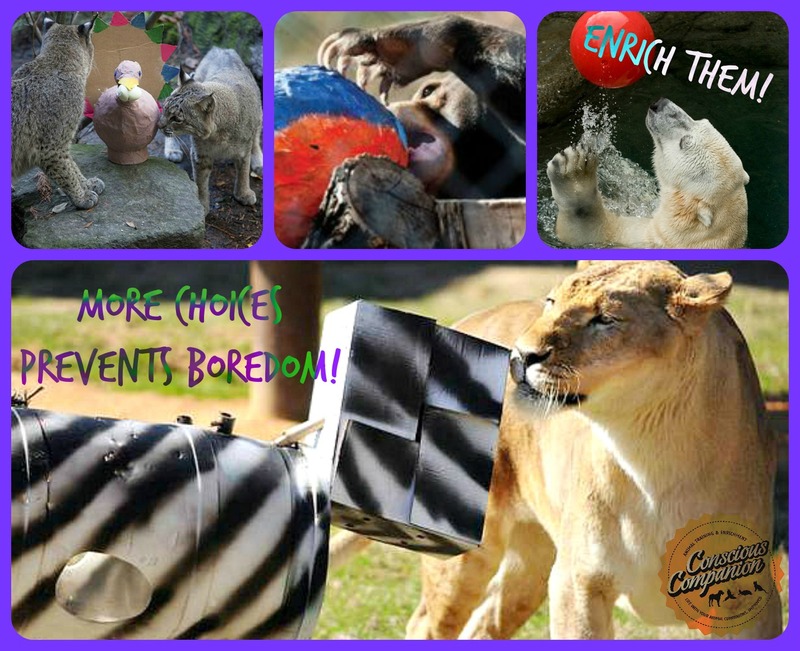 When placed in captivity, tortoises and turtles of all species need mental enrichment! Science is continually proving this! 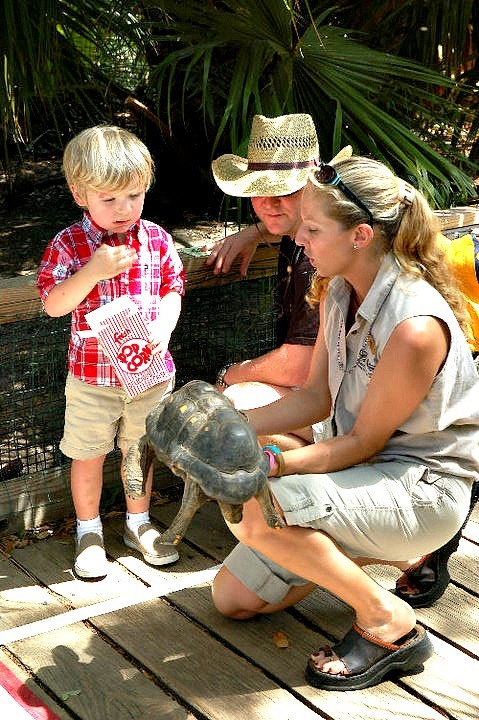 Here is one of our educational reptile representatives, the Red-footed tortoise. Educational outreach can be great mental and physical enrichment for reptiles, but we do need to consider that they can get stressed, too. Science is now proving that turtles and tortoises do have complicated cognitive abilities, so we must honor that with how we interact with them and care for them in captivity. This study was published in the July issue of the journal Behavioral Processes. Soon people all over the U.S. will be celebrating the Fourth of July and our neighbors to the north are preparing for Canada Day! Folks everywhere are getting ready for the visual and sound Smörgåsbord paired with good food, great friends, and family. However, most animals would probably order the food, but hold the fireworks. So while we are preparing to party, let’s prepare our pets, too. 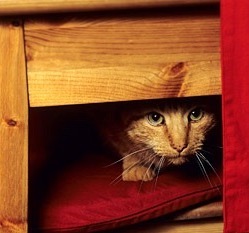 If you have worked or lived with an animal, you know that most of them are frightened of loud or startling noises. The fear of loud sounds is called noise phobias. Even if your animal companion has not displayed this fear before, the sights and sounds on The Fourth of July could easily bring out their most intense fears. Put yourself in their position. Imagine the scene: what is normally a peaceful evening at home suddenly turns into chaos. All of a sudden there are bright, flashing lights, loud banging sounds, people hollering boisterously, and things exploding over and over. These stimuli, paired with the unusual smell of burning sulfur and smoke, can bring on a full blown animal panic attack. Even children can be frightened by all of this, but since parents and kids both communicate in the same language, we are able to explain to them what is happening. When our rabbit, cat, dog, or parrot is freaking out during moments like this, we cannot just sit down with them and have a calm little chat to explain, “There is really nothing to fear, so just settle down.” Anything unexpected, out of their ordinary routine, or that involves sensory overload, is a recipe for a full-on Animal Freak Out. Whether you will be enjoying the festivities at home or away this year, you will need to prepare your home well before the festivities begin. 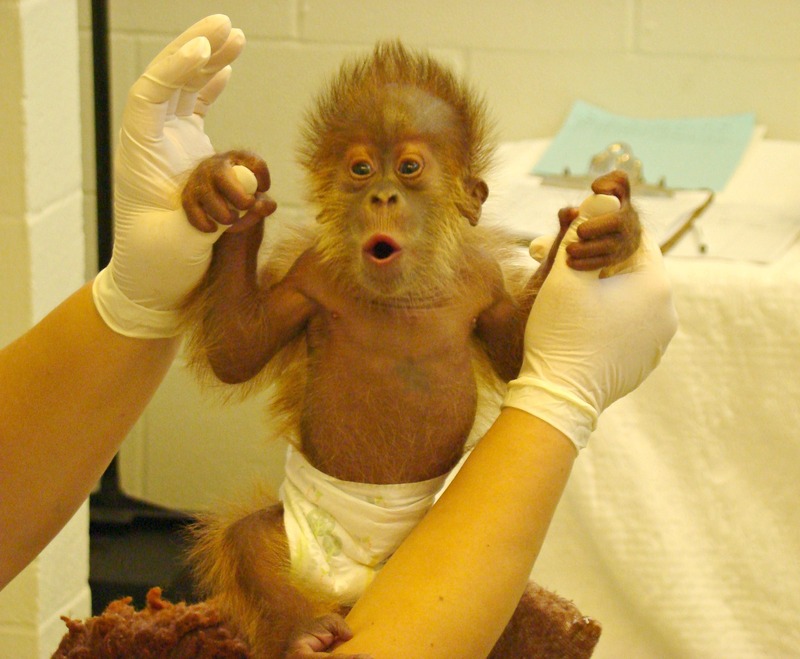 Sound Therapy: Playing calming, classical music is beneficial for many species. Therapeutic music such as Through A Dog’s Ear and Through a Cat’s Ear has been scientifically proven to reduce anxiety and have calming effects on cats and dogs! 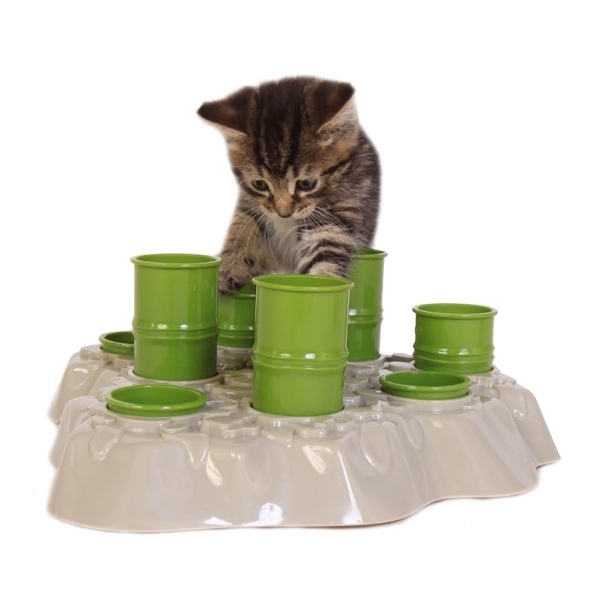 It is psychoacoustically designed and clinically demonstrated to calm the canine and feline nervous system. However, it’s most effective when you play the music well before the fireworks begin, at a time when the cat or dog is already relaxed. 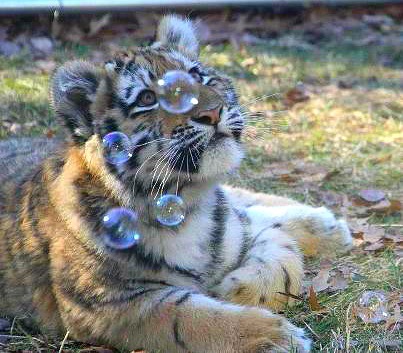 Animals will start to associate the music with being calm and content. Then you play the music a couple of hours before the fireworks start and continue to play through bedtime. Check out these free sound samples! Sound Therapy combined with Desensitization: The Canine Noise Phobia series (CNP) consists of four CD’s that can be used individually or as a set: Fireworks, Thunderstorms, City Sounds, and Calming. CNP is an innovative desensitization training tool that combines three distinctive elements for the treatment and prevention of sound-sensitivities and noise-phobias. This article by Mary Strauss, published in the Whole Dog Journal, gives a comprehensive overview of possible treatments for sound phobias. Scent: Homeopathic relaxation supplements such as Canine Calm, AviCalm, Feliway, and D.A.P (dog and cat appeasing pheromones), Spirit Essences, HomeoPet, and Pet Rescue Remedy are extremely helpful with calming an animal’s nerves on the big day. Pet Rescue Remedy works on everything from horses to reptiles. 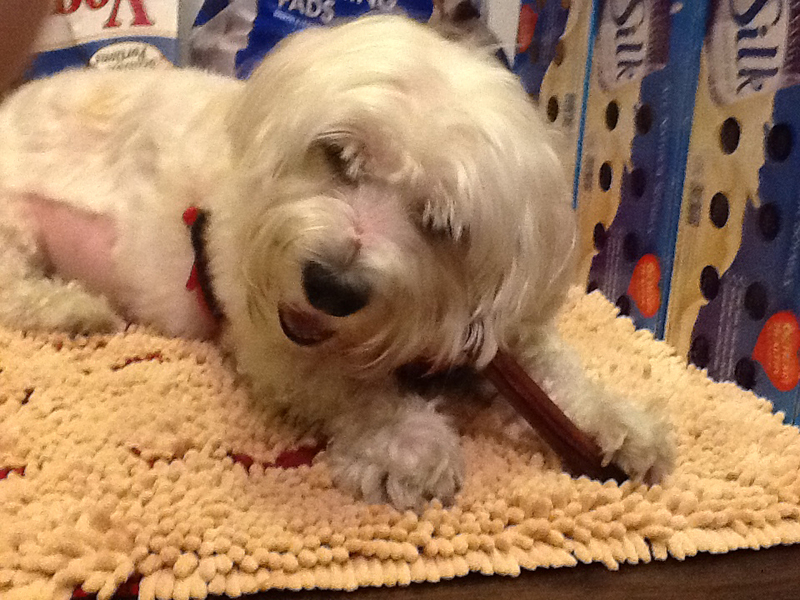 You can find Pet Rescue Remedy at most health food stores or animal supply stores. Applying a few drops to their food, water, or directly into their mouth BEFORE the booms begin can do wonders for stress levels! Essential Oils such as lavender and valerian can also help with various anxieties. Learn how here. Note:Feliway is a liquid synthetic copy of the feline facial pheromone, used by cats to mark their territory as safe and secure. You can sprayitontheirfavoritenappingspotstomakethem feel more secure. Tactile: There are two wraps on the market that reportedly help sound phobic pets. The original Anxiety Wrap uses acupressure and maintained pressure to reduce stress. Thunder Shirts have been successful with calming many dogs and cats. Over 85% of Thundershirt users see significant improvement in noise anxiety symptoms. The Storm Defender Cape has a metallic lining that discharges the dog’s fur and shields them from static charge build-up before and during storms. Rubbing an animal down with scent-free dryer sheets can help with reducing the static charge as well! Visual: Close the blinds or anything around the house that will help to eliminate the visual assault on their senses. Turning on lights around the house will also help to block out the flashes from the fireworks. Fort Hideout: Set up a “fort” or safe place of refuge for them in the home. If you don’t have a “safe room” for your pets, I strongly recommend that you create one. Itcan be as simple as a chair covered with a blanket, a comfy “hidey” spot in the back of the closet, the bathroom, or a covered crate that feels like a real den. Even the space underneath a bed can comforting. TIP: If you are not sure where to set up this safe zone, observe where each of your animal companions chooses to retreat when they are over stimulated. Ask yourself: Where do they go when company comes over, the big game is on TV, or when a storm hits? Where do they hide? That’s where you’ll want to start building Fort Hideout. NOTE: Be sure to set up this safe zone away from windows where the sights and sounds are loudest and brightest. Acclimate them to this safe zone before the firework festivities begin. Offer treats and attention when they are in this area. By doing this, you are creating positive feelings with this safe zone. You are welcome to share this image with others! Conditioning a dog to feel differently about the sound of fireworks can be achieved by gradually exposing the dog to audio recordings of fireworks at low volume levels and, if the dog appears relaxed, playing his favorite game or feeding him his favorite food. Allowing the dog to play and relax in the presence of the soft noise for a period of ten minutes, taking a break of five minutes and repeating the exercise ensures that the dog doesn’t become bored with the training. Introducing the audio at a low level again and slowly turning up the volume if the dog continues to be relaxed and able to concentrate on playing the game or eating the food allows the dog to habituate to the noise without a fear response. If the dog shows signs of stress, going back to the previous level and building up the noise level again will take pressure off the dog. The object of noise desensitization is to gradually expose the dog to louder and louder sounds over a period of time, progress being determined by the dog’s reactions. 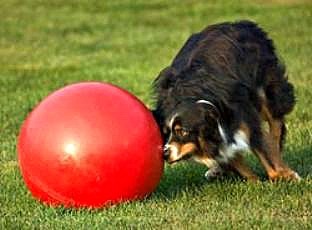 Going too fast might make the dog even more frightened, so taking things slowly will ensure maximum benefit from the process. 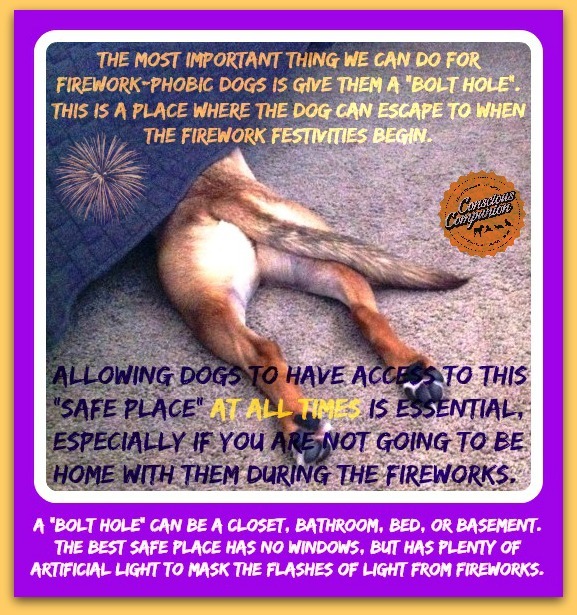 Some dogs will respond well to all of the above therapies, but will become panicked when the real fireworks start. It is therefore important to tackle this phobia in other ways by using effective management strategies and by masking any audio and visual stimuli that elicit a fear response during an episode. Ideally, you should desensitize them to loud noises well ahead of time. When you have the opportunity, gently pair loud or startling sounds with their most favorite treats, new toys, and playtime. You don’t have to walk around the house banging pots and pans, but you can help them to associate startling, loud sounds with positive treats … days and weeks before the fireworks begin. I keep the following Homeopathic items handy, whether we need them or not: Feliway, Canine Calm, AviCalm, D.A.P , Spirit Essences or Pet Rescue Remedy. Think of them as an ounce of stress prevention. I give everyone Spirit Essences’ Stress Stopper before the cracking, popping and firework bangs begin, to help them stay relaxed and have a positive experience. Then I will administer more as needed. If you know when the party and fireworks will begin, get potty time, walks, and dinner done ahead of time. If these noises are frightening to them, they will often refuse to eat, go outside to do their business, or even use the litter box. Getting these evening “business” routines done ahead of time will make everyone more comfortable. When walking them, be sure to have a secure hold of them; fireworks can start earlier than you expect and could easily startle them! Get them tired! (not exhausted): If you can give them a day of play at a puppy daycare facility, or even a just couple hours of romp and play time before the Big Bad Bangs begin, their stress levels can be greatly reduced if they are already content and tired from a fun day of play and exercise. Healthy play and exercise is great for reducing stress in cats, too! 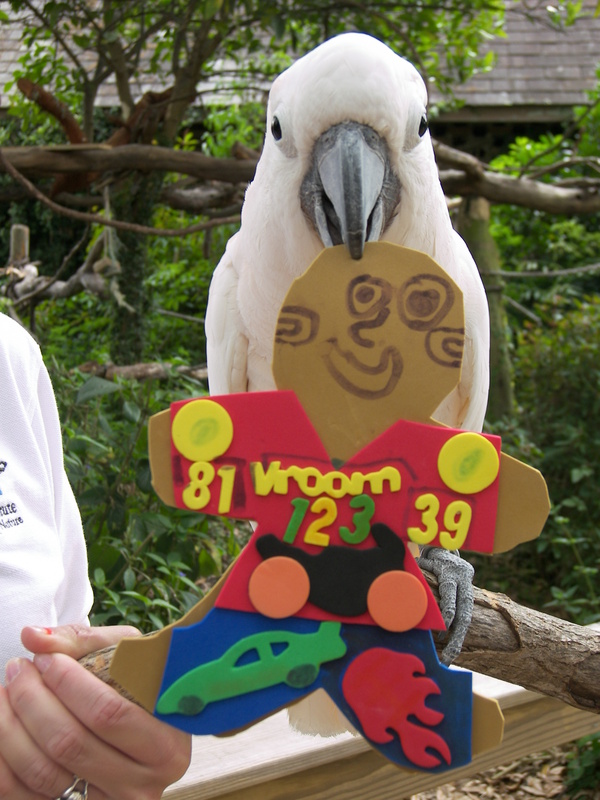 – Feather plucking + other signs of stress in parrots! If any of your pets are displaying fear and anxiety when the fireworks begin, stay calm and stay near them. 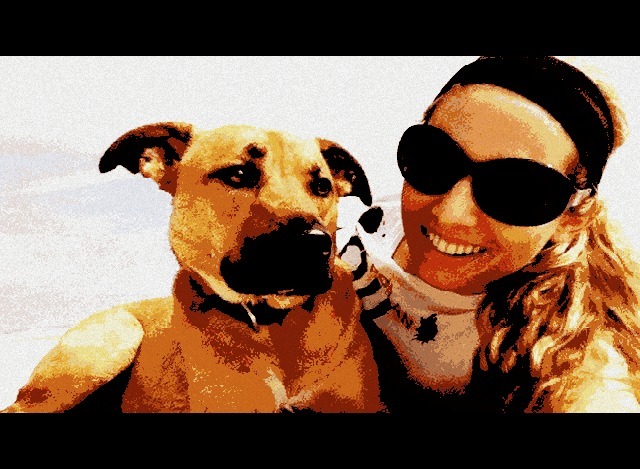 Many people believe that comforting an animal that is afraid will ‘reinforce’ their fear, but we now know that while comforting may not necessarily stop them from being afraid altogether, it will not cause them to be more afraid when the next boom rumbles and shakes the house. BEFORE they are even beginning to show signs of fear and anxiety, offer them Good Things! Be playful with them! Play games and break out the treats! 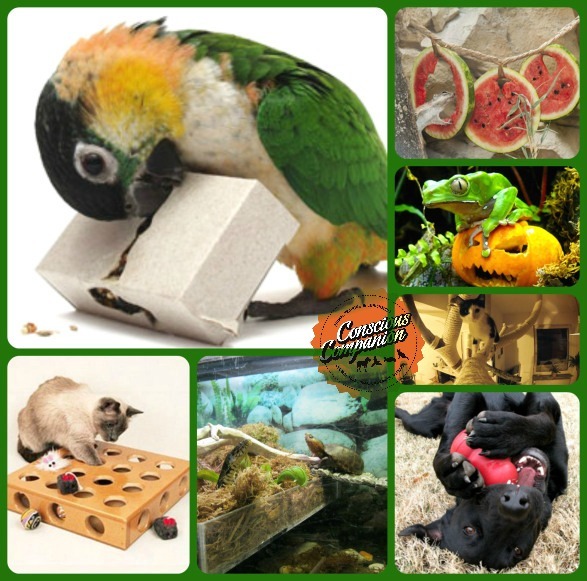 You can also offer novelty items such as cat nip, frozen soup (marrow) bones, Bully Sticks, and enrichment toys, such as KONG for cats and dogs! 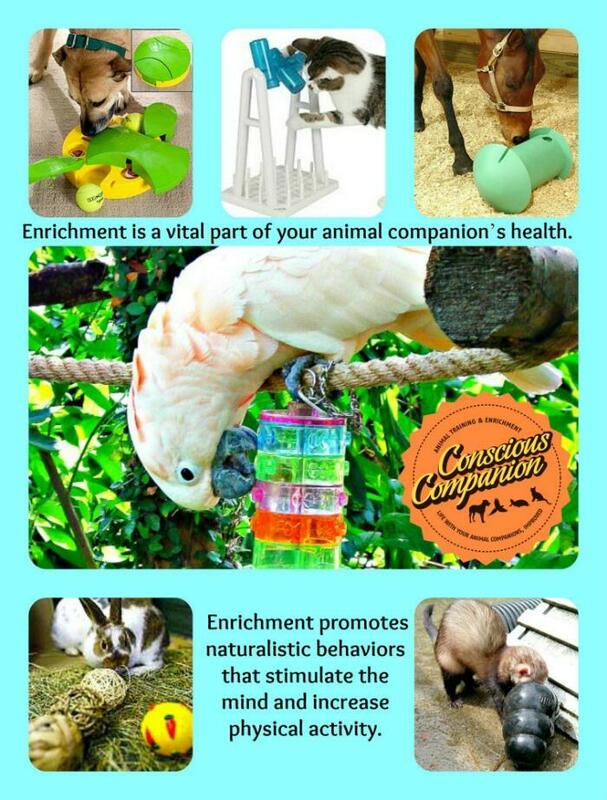 If you have parrots, check out these goodies from The Leather Elves. Grab some of that recycling material and create a fast, homemade puzzle toy! The idea here is to turn Fright Night time into Fun Night! TIP: Withholding these items for a few days or week ahead of time will make these treats even more special on the Night of Assault on the Senses. Medication alone is generally not going to “fix” much of anything. It’s can be a helpful intervention, but not a specific treatment. It needs to be paired with counter conditioning techniques. — Read how and why here. NOTE: Once widely prescribed for noise phobias, acepromazine not only doesn’t work, it might make things much worse! Avoid scolding or reprimanding them when they are frightened or nervous. Their anxiety doesn’t have to be understood, but merely respected. 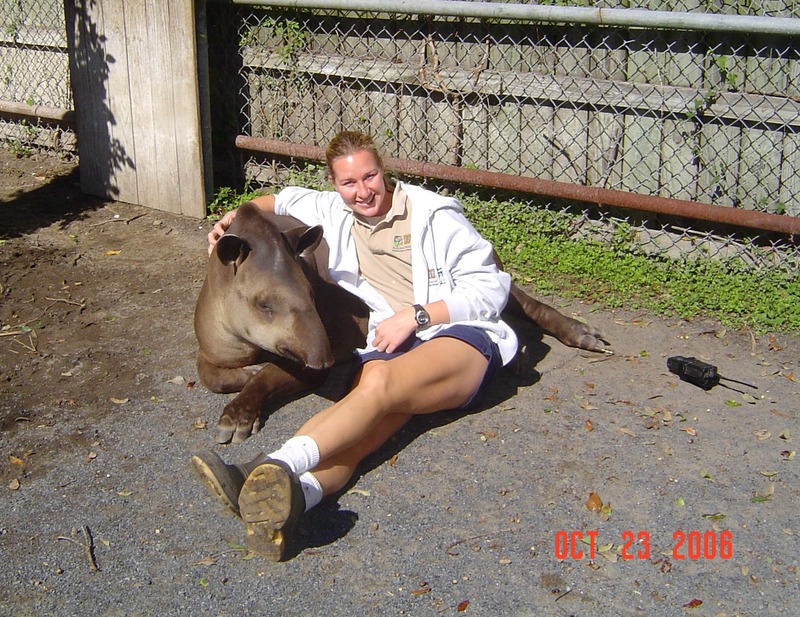 Many animals have fears that to us are not “rational,” but they are still very real for them. 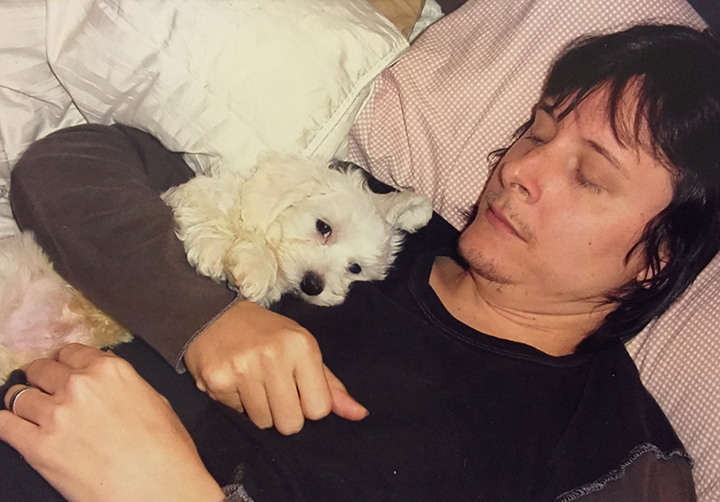 Note: Always comfort the animal. You cannot reinforce Fear! If you don’t believe me, read this! If you absolutely must take them with you during the fireworks show, always keep them on a safe, force-free harness, or in a fortified carrier. When an animal becomes startled or frightened they will run, and often run very far. Keep them attached to you at all times. Make sure their identification tags and your contact number are clearly marked on their collars; if they do break free from home, or from you, they can be reunited faster and more easily. Having your animal companion microchipped is also another important safety measure. It’s inexpensive and can be done within minutes at your vet. 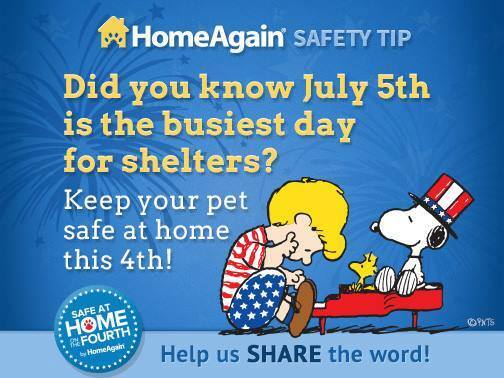 More pets go missing on the 4th of July more than any other day of the year. Animals are family, so it is natural to enjoy having them around you when you are celebrating. However, the 4th of July is not be the best time to have your animal companion tag along if you’re headed out, even if you’re going to what is supposed to be a “pet-friendly” party. 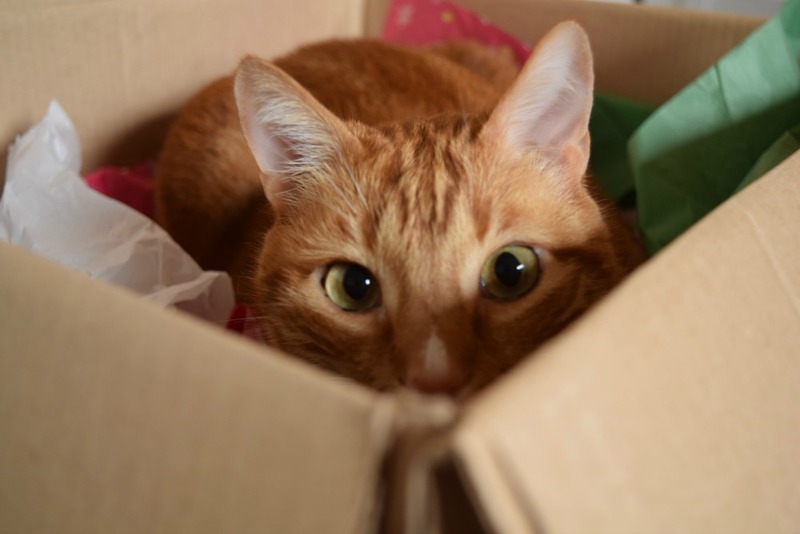 If you have set up safe zones, prepared the house, and your animal companions appropriately, they are going to feel safe at home when the noise chaos begins. Home is familiar, and home is safe – so please keep them inside until the celebration is well over. 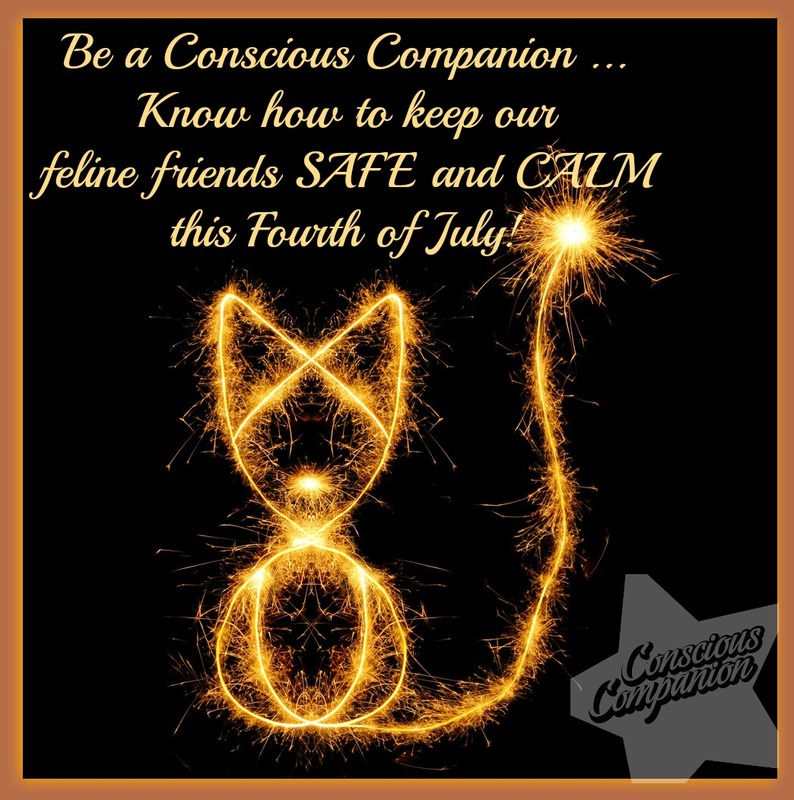 Suggested reading for cat guardians: Fireworks & Festivities Cat Safety Tips!